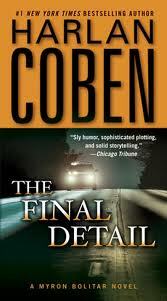 My Series Sunday pick is The Final Detail, the 6th book in the Myron Bolitar series by Harlan Coben. No one knows better than agent Myron Bolitar that life is hard, cruel and random. And this time, the mystery hits a little too close to home. Myron's business colleague and best friend, Esperanza, has been arrested for allegedly murdering an MB SportsReps client. Myron's immediate reaction is to jump in and start his own investigation. He is determined to clear Esperanza's name. But the more secrets he unveils and the closer he comes to proving Esperanza's innocence, the more guilty Myron himself looks. The Final Detail is the perfect recipe for a mystery. It's thrilling, suspenseful, and involves murder. Harlan Coben has won for the best mystery series ever! Each book draws me into the series and life of Myron Bolitar and supporting characters Esperanza, Big Cyndi and Win. Let me tell you—I finished this book in ONE day. Yes, within 24 hours. It was that good. If you haven't yet started this series, grab a YooHoo and get comfortable. You are guaranteed to get lost in this fiction story.